Swiffer Sweeper wet mopping cloths are designed with a unique cleaning solution that works to dissolve tough spots, dirt and grime and pull it deep into the cloth and off your floors. It’s even safe to use on wood floors*. *Do not use Swiffer Sweeper wet cloths on unfinished, oiled, or waxed wooden boards, non-sealed tiles or carpeted floors. Using deep, dirt-grabbing ridges and grooves, our Dry Cloths pick up more dirt, dust, and hair than a broom. You’ll notice the difference when you see an amazing clean on virtually any surface. Swiffer Wet Mopping Cloths have powerful dirt-dissolving cleansers that pull dirt from surfaces and lock it away. *DO NOT use Swiffer Sweeper Wet Cloths on unfinished, oiled, waxed wooden boards, non-sealed tiles, or carpeted floors as they may be water sensitive. Also try Swiffer Sweeper DRY Sweeping cloth refills! 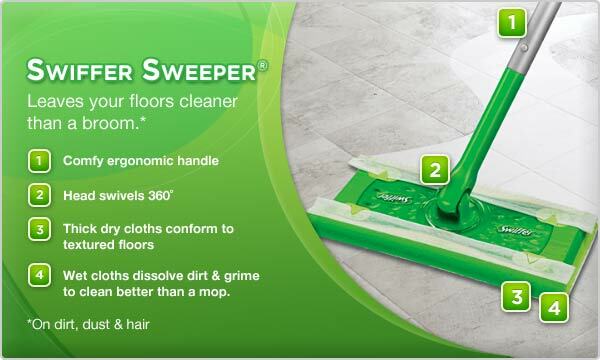 Before Wet cleaning your floors with Swiffer WET mop cloths, first dry sweep your floor with Swiffer Sweeper Dry Sweeping cloth refills!